This is a fairly young Greyhound. The owner didn’t want to come near me. The Greyhound was interested/intrigued in me. I’m kneeling on the ground with the camera taking his photo. The owner was pulling him to go the other direction. 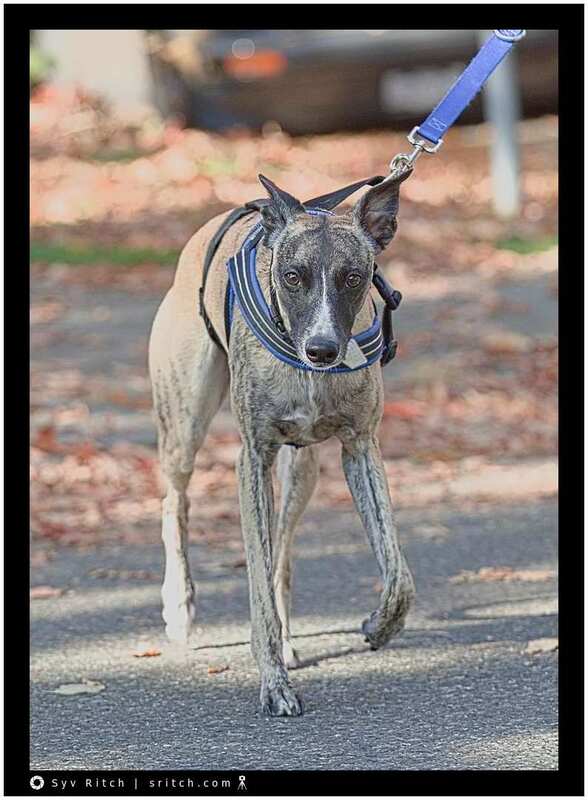 In my area, quite a few people now have Whippets, the smaller cousin of the Greyhound. There are a couple of older Greyhounds but these are rescues either from Mexico or from Las Vegas. Young local Greyhounds are very rare. They need to run, some people have meet at the beach, but that’s only for the ‘good’ Greyhounds. The beach is not fenced and I wish you good luck running after a Greyhound running away.